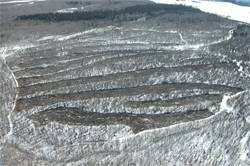 This 50-acre area was crushed in strips to provide cover as well as forage for moose. Using a bulldozer to crush acres of vegetation may not strike most people as a habitat enhancement project, but moose love it. Willow, aspen and poplar are nutritious, high-quality forage for moose. These plants can regenerate and thrive after certain kinds of physical trauma, such as fire or crushing. Lush sprouts emerge from the ground level – gardeners refer to them as suckers – and quickly grow. Wildland fires are a natural part of the Interior Alaska ecosystem, and plants and animals have adapted to periodic fires. Wildlife managers and foresters sometimes use controlled burning as a habitat-enhancement tool to stimulate this kind of plant growth. But there is another natural phenomenon in Alaska that also stimulates these plants. During spring break-up, massive chunks of ice are rafted down rivers, scouring riverbanks and gravel bars. Mechanical crushing can be used to mimic this process. In March, a D6N Caterpillar dozer worked for 37 hours crushing or “mechanically treating” about 50 acres of land near Chistochina, land owned by the Cheesh’na Tribal Council (Ahtna Inc.). The site, about halfway between Glennallen and Tok, is on the floodplain of the Copper River. The area was crushed in strips to maximize the relationship between forage and cover. Winter is the ideal time for crushing, while the trees and shrubs are dormant and the majority of their nutrients are stored underground. The site was identified through aerial surveys as an important winter concentration area for moose. The moose population in this area, Game Management Unit 13, has declined in recent years. The population decline was initially precipitated by several back-to-back years (1988-1994) of deep snow. However, increased predation since then (the wolf population increased nearly 60 percent between 1995 and 2000) has kept the population from recovering. State wildlife biologist Becky Kelleyhouse said because habitat projects are expensive, they should only be used in areas where the moose population is – or is expected to be – sufficiently high enough to take advantage of new regrowth. With recently reduced wolf numbers, there should be enough moose coming back to this area to make this project worthwhile. This area near Tok was crushed 12 years ago, stimulating plant growth. New deciduous regrowth should be available to moose within about four years and should benefit moose in this area, particularly during deep snow winters, for up to 20 years or more. The Chistochina moose browse crushing project is a cooperative venture between the Alaska Department of Fish and Game, the Alaska Soil and Water Conservation District, the Cheesh’na Tribal Council (CTC), AHTNA Inc., the Bureau of Land Management (Glennallen Field Office) and the Alaska Moose Federation. Fish and Game and the BLM plan to cooperatively monitor the area for browse regrowth and utilization by wintering moose. Kelleyhouse said the agencies hope to use this opportunity to bring local kids out to the field and directly involve them in active wildlife management. If future funding allows, additional acreage in this area will be crushed in coming years. This type of staggered crushing would help to ensure diverse vegetative regrowth and would be most beneficial to wildlife.